Making the point and making it portable: engaging a farmer on-the-go. According to a Farm Journal Media survey, the majority of farmers already use smartphones and tablets. Nearly 90 percent of farmers will soon own a smartphone. In addition, 75 percent use smartphones for email. Is your email readable on a smartphone? Responsive web design is a technique where a web page “responds” to the device viewing it. For smart phone users, the web page will present larger text, smaller images, change the menu, and other techniques to make it more readable and usable. Your email should be responsive. It should present well on both desktops and mobile devices. 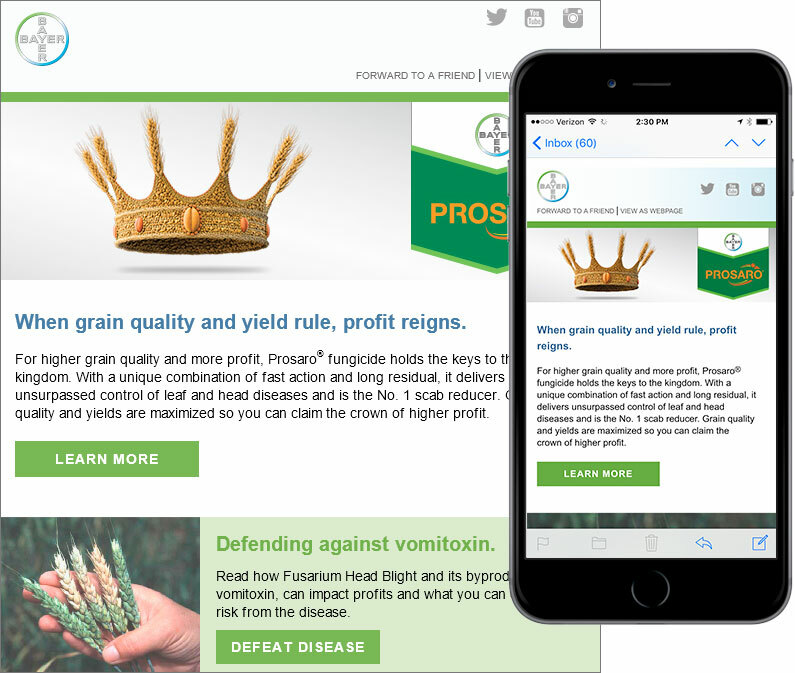 Below are some examples the demonstrate the value of responsive emails. The copy is too small. 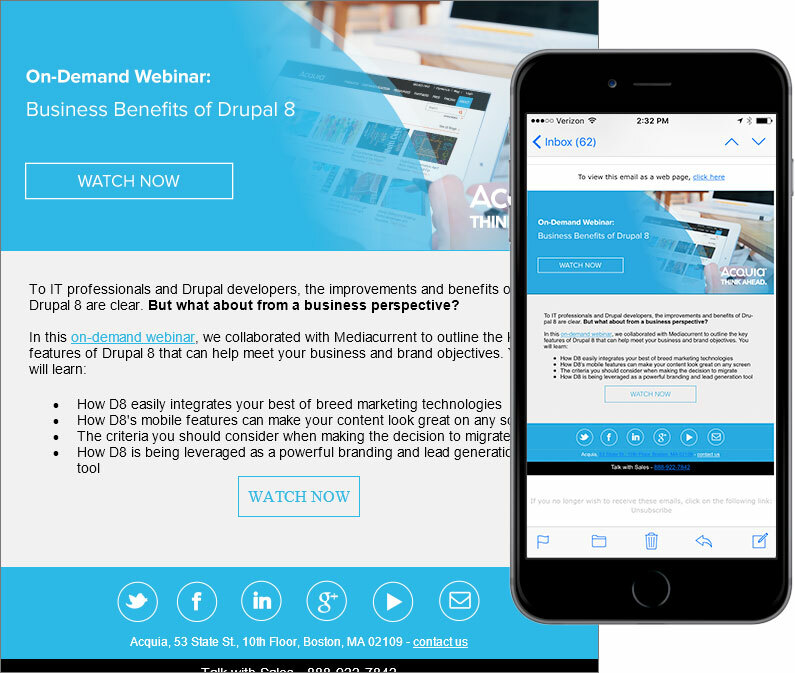 The link in the copy (“In this on-demand webinar”) is difficult to tap. The social sharing icons on the bottom (Twitter, Facebook, etc.) are too close together. This is an example of responsive email design. The mobile view uses larger copy. The top image didn’t contain message copy, so readability isn’t an issue. The call-to-action button is large enough to tap. Those who have been doing email marketing for a while are familiar with the concept of “above the fold.” Email designers tried to keep key messaging at the top of the email, so it would appear in a preview pane on Outlook. Mobile users are used to scrolling – it’s the way they view almost everything on their devices. While it’s still best practice to keep key messaging close to the top of the message, users will scroll down if they are interested. The “fold” doesn’t exist on smart phones. Always remember, the destination for any link on your email should go to a responsive web page. 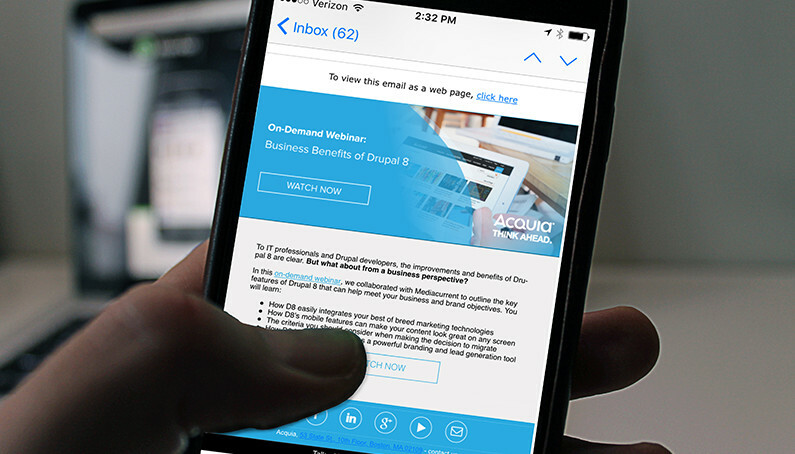 Email clicks won’t bring you much business if you take mobile users to a non-mobile experience. Ensuring your email content, design and platform are mobile-friendly, along with any linked pages, will guarantee your customers have a good experience with your brand and communications.